Open house educates the public about new housing efforts. 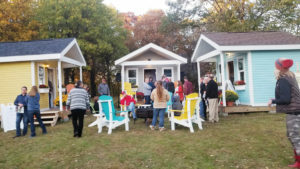 The public toured tiny homes on Oct. 19 and heard about Joppa’s plan to provide transitional housing to the homeless. Hope is on the horizon for people without a home. And it is arriving just in time for the holiday season. At a recent open house, Joppa — an organization helping homeless people survive, find housing and rebuild their lives — showcased three new tiny homes that were built as potential housing options for people in need. The tiny homes were on display at Polk City Methodist Church, 1421 W. Broadway St., where volunteers led public tours last October. Joppa’s tiny homes are designed by BSB Designs and measure approximately 90 square feet. Each is fully furnished and equipped with a bed, TV, refrigerator and microwave. The plan is for each tiny home to be within 50 feet of a building with private restrooms, showers and laundry facilities. All the residences will be located in a gated community, and the organization is looking for land to place the houses. Ideally, the homes would be placed within 1 mile of a bus stop and within 1 mile of a grocery store. The goal is to build 50 tiny homes for temporary housing to transition people away from homelessness. The cozy abodes come at a cost of approximately $6,000 for construction materials and $1,500 for the fixtures and furnishings. So far, donations and pledges have been received for 40 of the 50 tiny homes. Area high school and college students are building the homes. Seven homes are completed. “It’s a great organization,” says Karen Thompson, who lives in Urbandale and has volunteered at Joppa for three years. She helped give tours and welcome the visitors. Cindy and Jim Pierce and their three grandkids — Madison, Savannah and Jacob — decorated the yellow tiny home. The group is also building cottage homes for the Des Moines area as well. These slightly larger dwellings offer more permanent living, measure 384 square feet and cost $35,000 to build. The anticipated rent for a cottage home is $300 to $500 a month.